After we had Jona, Aaron and I decided that we'd like to visit at least one baseball stadium (other than our local Kauffman) every year. We went to St. Louis to see the Cardinals for Jona's first vacation, but until this year we haven't had a chance to visit any others. This year though we decided to make Violet's first vacation one to Minneapolis, to see the Twins play (and more of course). We had a wonderful time, and everyone concluded that Minneapolis is a place we'd very much like to return to when we get a chance. Here are some of the highlights of our trip. 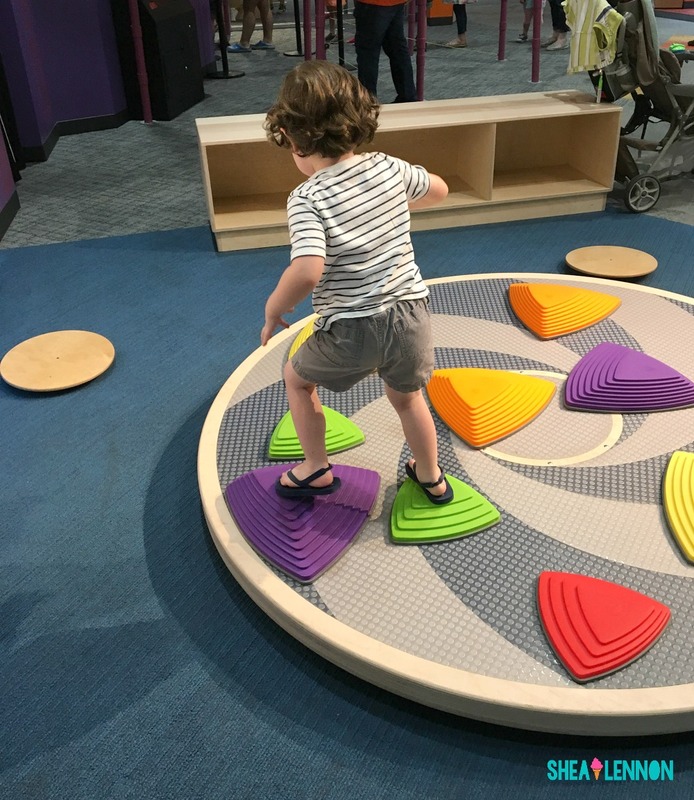 Minnesota Children's Museum - Recently renovated, this huge, interactive children's museum has so much to offer to kids of all ages. A few of Jona's favorite areas were "Our World", an interactive mini city, the "Backyard", an outdoor exhibit, the car wash area, and the seed-filled sensory tables. There's even a place for the baby/young toddler crowd, although since Violet was content to observe from the stroller, we didn't have a chance to check it out. 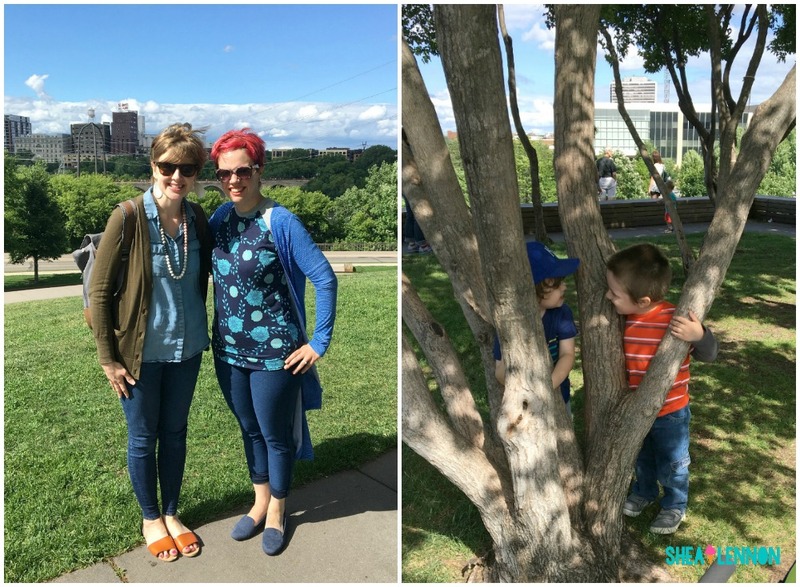 If you have kids, this museum is a must-see in Minneapolis! Como Zoo - When Beth told me about this FREE zoo in St. Paul, I knew we had to visit. 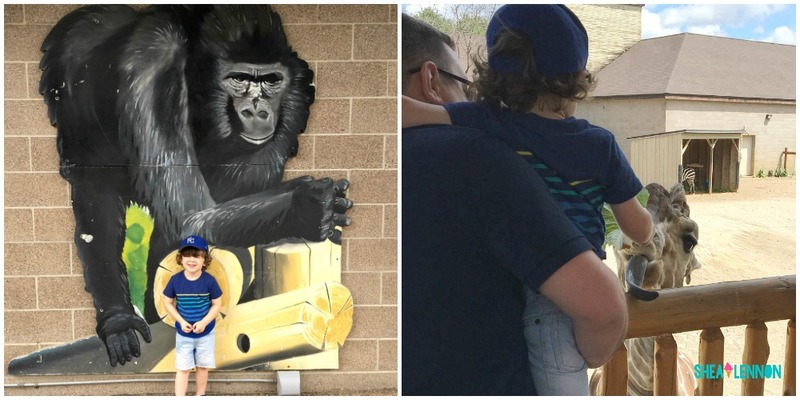 Zoos are no-brainers when it comes to trips with kids, and especially for a free zoo, this one didn't disappoint. I like that it seemed to be designed with kids in mind, and that many of the animals who are typically kids' favorites (polar bears, gorillas, giraffes, big cats) were fairly close together. It may be the quickest way to blow through $5, but be sure to let your kid feed the giraffe! When traveling with kids, I think it's important to include some wide open spaces in the travel itinerary. So much time is spent in a small hotel room, in the car, or at restaurant tables--a park gives an energetic kid some space to run! Pizza Luce - I'm a sucker for good pizza, plus it's one of the few foods that Jona is guaranteed to eat, so I knew we couldn't go wrong here. They had a mix of classic and unique varieties, and the Korean Flank Steak pizza I got (one of their monthly specials) was no joke one of the best pizzas I've tried. Violet enjoyed gnawing on my pizza crust and sharing her feelings with the entire restaurant. At least they were happy feelings. Hell's Kitchen - I am a breakfast person, so when multiple Minnesotans we know recommended Hell's Kitchen to us, it was the first thing to go on our "must eat" list. I had the Huevos Rancheros, which was wonderful. They had me at hash browns. Aaron had the Lemon-Ricotta Hotcakes, which he loved, and Jona got a Cornmeal Waffle (which I had to try...boy was it good). I can usually find something for Jona to eat wherever we go, but breakfast restaurants are also perfect for Violet, who is still new to solid food. Fruit often comes with the meal, or can be ordered on the side, and things like bananas and blueberries are perfect for little tummies. Brit's Pub - This restaurant is exactly what it sounds like: a bar with British pub fare. I had Chicken Tikka Masala, which was so flavorful and delicious. Aaron had the classic fish and chips, which he was kind enough to give me a bite of. The crispy fried fish tasted great, especially dunked in a bit of malt vinegar. 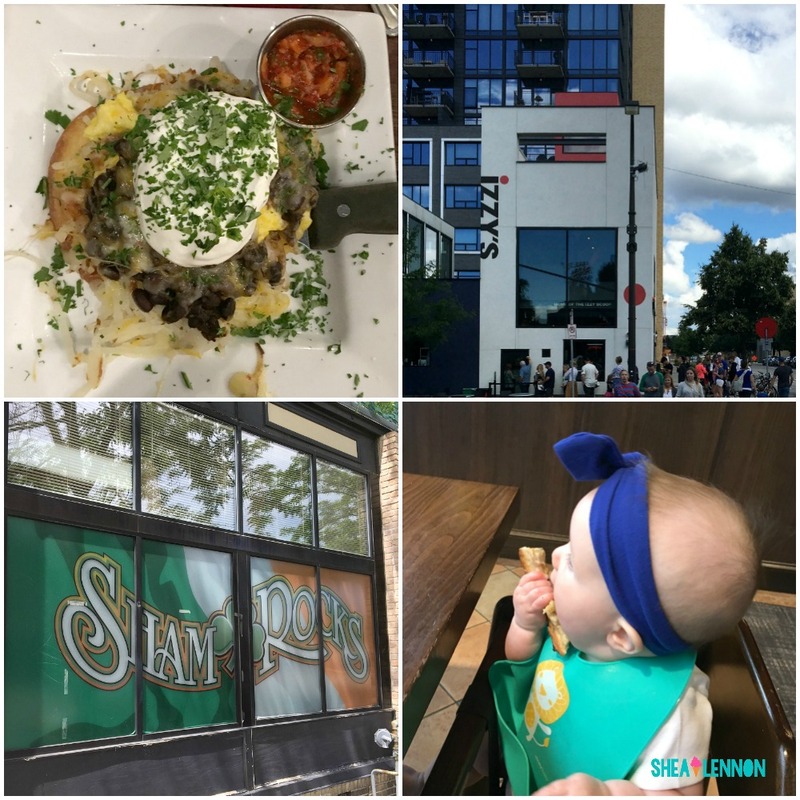 Izzy's - How can I talk about food without mentioning ice cream? We heard that Izzy's is the place to go for homemade ice cream. They have a wide variety of flavors, and now I wish I would have made a note of what we tried. Of course I went for something super chocolaty, balanced with a scoop of salted caramel. Aaron had a whiskey-spiked variety, and Jona went with classic chocolate. They are known for their "Izzy scoop", a small scoop of ice cream that tops each cup or cone, which is a fun way to try a new flavor. Not only was the ice cream excellent, but they were also such kind people. Trying to stand and eat (a challenge at times), Jona dropped his ice cream, and they gave him a new one without me even asking. Thanks Izzy's! Other delicious destinations were Hi Lo Diner (try one of their unique Hi Top donut stacks--I had the Gary Cooper), Shamrocks (you can't go wrong with a stuffed burger), and the adorable Blackbird Cafe. 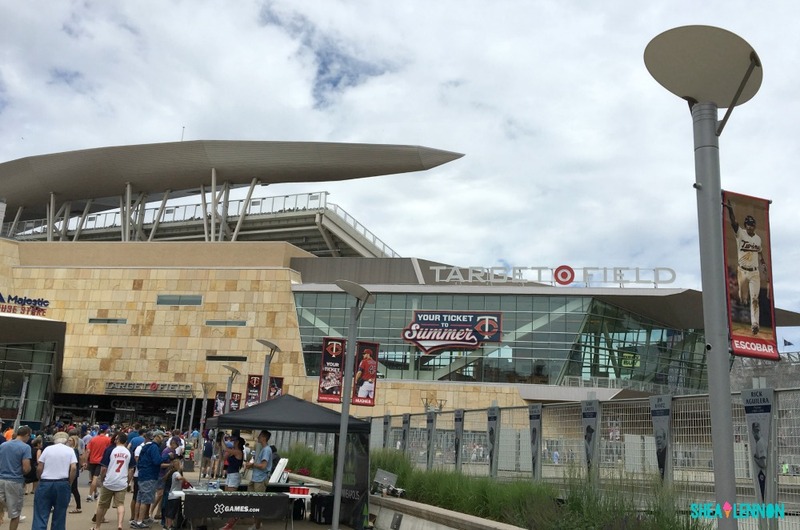 Target Field - This was the whole purpose of our journey, but even if you're not a huge baseball fan, I think you'll still enjoy it here. Princess Violet was not content to sit on a lap in our seats, so we spent the majority of the game walking around the stadium, much to Jona's dismay. My little baseball fan kept asking to go back to our seats to watch the ball game--he especially loved it when the field crew came out to smooth the dirt and replace the bases. We didn't eat much there, but it looked like there was quite a variety of food to choose from. They had a great beer selection as well, and I tried Farmgirl Saison, which was perfect for summer, light and refreshing. Of course Jona and I had to sample the ice cream selection, him with a soft serve sundae in a mini helmet, me with some gelato. Despite the fact that we were decked out in our Royals gear (although the Twins played the Cleveland Indians that day), everyone was incredibly friendly. Other than lots of food and beer, there's also a little play area for kids who need to get some wiggles out. It's not huge, but a nice option when you spend some time out of your seats. Downtown Minneapolis - This isn't a specific location, but we stayed right downtown and I highly recommend doing that if you go. We were minutes away from plenty of restaurants, Target (how cool is downtown Target?! ), and even just a 20 minute walk to Target Field. 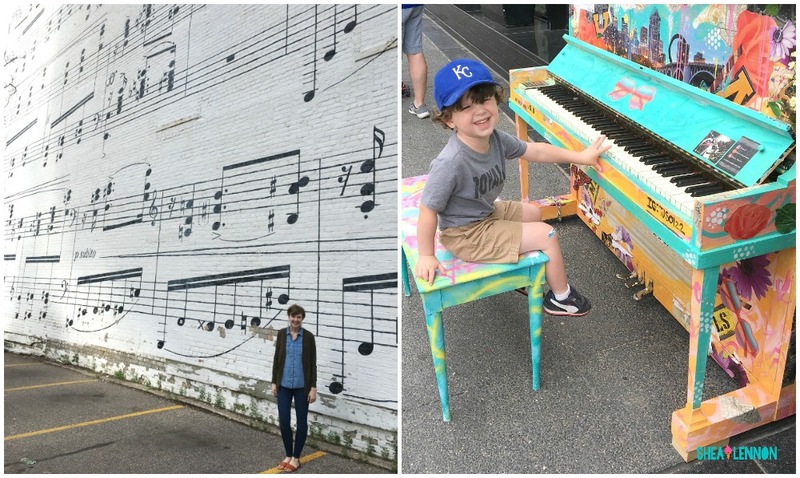 There seemed to be a music theme near where we stayed, with this incredible music mural, a colorful piano that beckoned "Play me! ", and even treble clef bike racks. 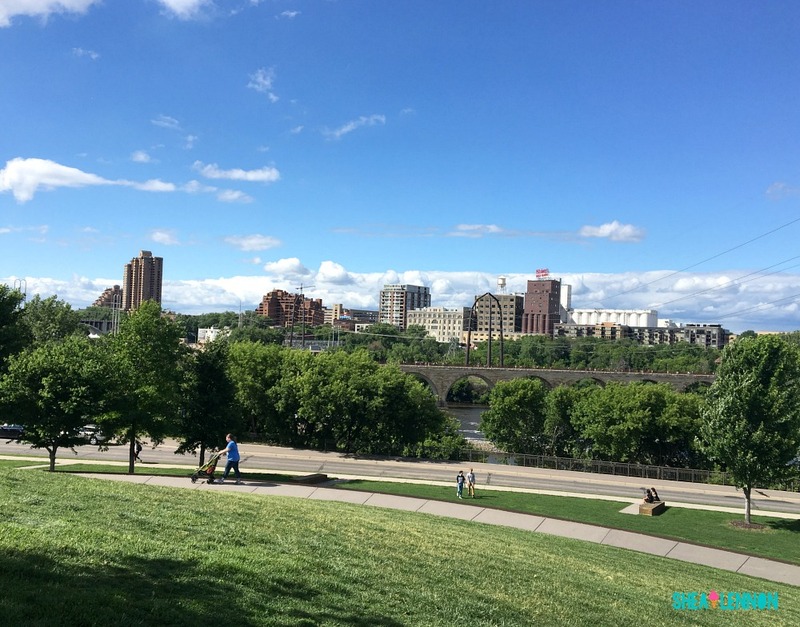 Have you been to Minneapolis? What else do you recommend?